Our Career Advising Program is intended to help each student explore the various medical specialties during their medical school experience while being kept abreast of the important guideposts toward matching to their chosen specialty of medicine and awareness of practicing in these areas. Students receive career counseling through one-on-one and small group meetings with the Assistant Dean for Outreach and Career Development (ADOCD) and with individual faculty. An introductory overview begins in the fall of the MS1 year by connecting each student with the AAMC Careers in Medicine program. Following this introductory overview, MS1 students schedule one-on-one meetings with the ADOCD to review the Careers in Medicine self-assessments and discuss their career aspirations through year two. 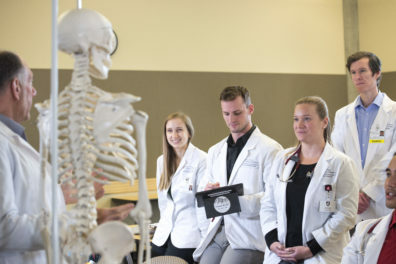 To prepare students for activities that strengthen residency placement, Clinical Career Advisors are selected during the students’ second year with assistance from the regional Associate Deans for Clinical Education (ADCE). When students transition to clinical campuses in Years 3 and 4, Clinical Career Advisors will provide career guidance in coordination with the ADCEs, their Longitudinal Integrated Clerkship (LIC) faculty and the ADOCD. January - May: One-on-one follow-up with the ADOCD as needed. MS1 and MS2 students are required to meet, at a minimum, once per academic year with the ADOCD. The purpose of the mandatory session is to review the student’s thoughts, concerns and questions regarding career advising, clinical campus week preceptorships, and specialty choice. The meeting is also a chance to discuss the career advising calendar of programs and other issues students have in the areas of professional development, summer experiences, and residency matching. Subsequent one-on-one meetings with the ADOCD are determined by student need. MS3 students will be required to schedule a minimum of one meeting per academic year with their Clinical Career Advisor. The purpose of this mandatory session is to discuss thoughts, concerns and questions regarding career advising and specialty choice. The session will also provide important dates related to applying to residency such as professional development, residency matching and any other issues of importance. Attendance for every event is tracked to ensure that appropriate information is relayed to each student and that additional support can be identified and provided. Students receive regular communication from the ADOCD, and additionally through a dedicated career advising channel on the social media platform, Slack. Each student will join a Learning Community upon admission to the Elson S. Floyd College of Medicine designed to provide opportunities for inter and intra-professional collaboration, collegiality, service learning, partnership and professionalism. These cohorts are overseen by the Office of Student Affairs and assigned a team of mentors to help foster these goals during the first two years. Upon transitioning to their regional clinical campuses during years three and four, additional mentors will be added (such as on-site Clinical Career Advisors) to assist each student in focusing their specialty interests and preparing for application to residency. As they mesh within their Learning Community, students will begin to highlight their own individual goals and values. The process will be supported and nurtured by the entire team: Clinical Portfolio Coaches, Clinical Career Advisors, Deans, and Longitudinal Integrated Clerkship faculty. Regional health care practitioners will further assist in this acculturation by serving as an invaluable resource pool for entwining the solid basic foundational science obtained during years one and two with their longitudinal integrated clerkship and clinical experiences during years three and four. The desired result will be to enhance real-life exposure, to maintain 360 degree support and continue to keep the student fully informed of a myriad of specialty choices. The Career Advising Program is meant to assist and guide a student into a logical and comfortable specialty consistent with their skills and wishes, and then ultimately into the residency of their choice. Our carefully trained team will help provide enlightenment and holistic assessments during their early clinical campus weeks and later during their longitudinal integrated clerkships. What emerges will create a template for current, timely, and useful information necessary for specialty selection. Linking students to faculty and community experts trained to provide the latest advising support information, the student–physician will be supported by the availability of an on-going data-base of resources for clinical, research and educational opportunities as they progress through their four-year journey at ESFCOM.